Royal Jordanian Airlines (RJ) has been ranked fourth in best on-time performance (OTP) among all airlines operating in the Middle East for the year 2018, according to the Punctuality League 2019 report prepared by OAG Aviation. The report showed that 77.13% of RJ’s flights took off and landed in 2018 on schedule, to be among the top five operating airlines in the region, with OTP being based on flights that arrive or depart within 15 minutes of their scheduled arrival/departure times. 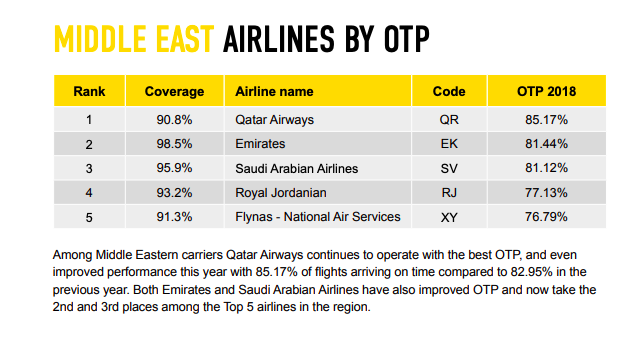 Qatar Airways ranked first among Middle Eastern airlines with 85.17% accuracy, Emirates in second place with 81.44%, Saudi Arabian Airlines in third place with 81.12% and Royal Jordanian in fourth place at 77.13%. For his part, President and CEO of RJ, Stefan Pichler, expressed the company's joy in obtaining this advanced ranking, stressing the keenness of Royal Jordanian to raise this rate and achieve the aspirations of the company and passengers alike by continuing to provide the best air and ground services and ensure flights arrive on time. Pichler congratulated RJ’s staff on this achievement, appreciating all their efforts, especially those working in the operational and service departments, whose role played a major role in getting RJ in this advanced arrangement regionally and globally.